We see all these shop restored cars and tons of the home restored versions on the web, at the shows and other places.. I know there are multiple levels of restoration. But what ... as far as true concours level.. are the chances of a fellow at home actually reaching the top level of concours vs. a shop restored car. Do you feel that the limitations of a home shop are to difficult to overcome or has the hobby gotten to the point where a average capable fellow can truly build a top show winning car? It all comes down to that individual's skill level, access to proper tools and equipment, patience, attention to detail, research, and deep pockets. Several members here have completed concours level restorations that I would bet the majority of shops would not be able to compete with, as I don't think most shops would pay that level of attention to all of the little details. I would agree with Jason. The big 3 are skillset, time and money. I have seen a lot of restored cars with bad paint jobs and incorrect details that where done by so called pros. I think you can do a nice restoration your shelf has long as you have the money and a lot of time. To add to the previous posts which I totally agree with, with the passage of time good quality original or NOS parts are getting harder to find and very expensive. As a result, it's harder and more expensive to do a top quality street driven or trailered concourse restoration these days, than it was 10-15 years ago. It's not impossible if you have a good starting point and the budget and time to find those right parts. I have done two a 69 March 18 years ago, and more recently a 73 that I have been collecting parts for it for over 20 years. Given to scarcity and cost of parts today, I am not planning to do anohter one. For example, I bought this pair of Ford convertible quarters and a front fender 20 years ago for $400 and used them on my 73 restorations, but before I did someone 2 years ago offered me $2,500 for them. Who can afford it at those prices? Furthermore, I love our 71-73 cars, but they don't command that kind of money, so you have to do it for the love of the car and the satisfaction of successfully completing a concourse quality restoration. BTW: I had a shop do the sheet metal and paint. Machine shop do the short block and trans. The rest I did. I hear you about the NOS sheet metal. 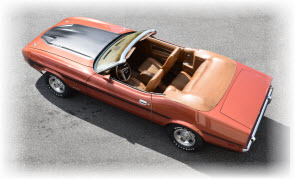 Before I started the bodywork on my car, I found an early (like 1974 date code) left rear quarter for my '71 convertible, for about $800 as I recall. 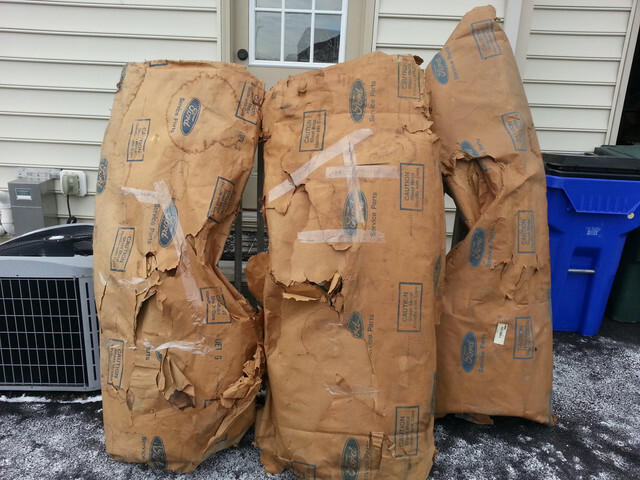 The shipping company folded it in half. I hauled my NOS ram air hood (still in the box!) back myself. Fortunately I got all my money back and when we got into the rear of the car, there wasn't enough rust damage to require a complete quarter panel. To add to the prior posters. First you need to know your skill levels in all of the required areas of doing a true restoration. Basically, can you build a car? I will say I cannot do paint & body and truly know that is a skill I will never poses. I farmed out my paint and body to a shop I heavily researched before dropping the car off. The search for parts can be daunting but very rewarding when you find that NOS part and get a reasonable price. Those days are starting to slip away quickly as the 71-73 models come more into the light of appreciation in the marketplace. I was comfortable moving forward from the completed shell to finish the build and outsourced the engine machining. A close friend very skilled at engine assembly assisted with the engine build. I have been very honored to achieve 4 of 4 MCA Golds in class CDE (Driven Concourse). Each time I have been judged I took their feedback and made improvements in the areas of note. This was my first and final concourse build (i think). I always knew in my heart and soul I would restore this car to concourse. Having accomplished that it is now time to move on to enjoy builds and restorations to the degree I want. Some pictures to back up my story. Always remember to do the build as you want to do it after knowing and understanding what is involved to get it to that level. Once you set your goal write it down and post a sign with it in your garage. You will be tempted many times to veer from your goal as the build progresses. Finally, HAVE FUN! If you are not enjoying the overall process you are doing it for the wrong reasons! A rule of thumb: 90% of your effort and 90% of your money will be spent on the last 10% of the car to get it to Concours correct! For us on the wrong side of the pool, unless you'd have very very deep pockets and someone on the other side looking for parts its not really doable. At TMCM (Dutch Mustang Club) The few 7173 that were showing up at the meetings for the concourse category, were judged with a list, and it was a list that was not considering the level of details expected in the states for the same category. You would check if a part would be motorcraft or whatever for that year/model and get points for having it and some points for its state if present. In the end, a car that was well maintained using repro's or clean original parts had a great chance of success. Which is already expensive and time consuming thing over here. But this make the hobby still accessible to a broader range of people (and wallets). I can really value the work involved to maintain/detail a car already in a perfect condition, its a hobby demanding lots of research and detailing work. Letting all the work done by a shop, pay a big check and go get some cups is not really the hobby to me. Guys like Jay Leno being the exception. @soonerbillz, if you restore that grandé the best you can in its original glory, have fun doing it and eventually enjoy driving it, you'll get my points!